This is the easiest and cheapest way to disinfect water in small quantities by exposing transparent water bags or bottles to the sun. 2) Who use this means ? In ancient times, some people in India had already become used to better orienting water in relation to the sun after observing that its quality was improved, but without explaining this and without making it known. The idea was taken up again in a 1984 UNICEF publication, then during the ’90s by researchers at the American University of Beirut and other Canadian (CRDI) and Swiss (EAWAG, then SODIS) organisations so as to perform numerous tests and lab experiments so as to precisely understand this phenomena of disinfecting water by irradiating it with sunlight and especially to measure and prove its efficiency. Because it is extremely simple and practically free and that this can be used anywhere where there is enough sun, without the need for any particular care. Naturally, it is also possible to boil the water, but this is far more expensive, especially at times when the cost of energy is rising considerably and this is also less eco-friendly. 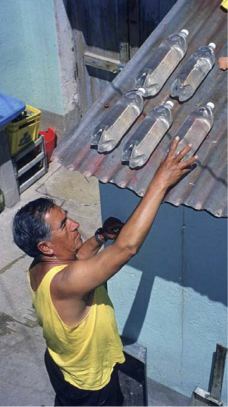 Everyone can use this process so long as they live in a sunny region and it only requires limited amounts of drinking water, but it is however especially useful in countries where water is scarce, of mediocre quality or not very safe and where other treatment systems either do not exist or are inadequate. This is the case in many villages, some outlying urban areas or in isolated regions. This may also be the first way to bring help to people or emergency workers arriving in an area where they do not yet know whether the water available is drinkable or not. 5) What does this process involve ? How does it work ? 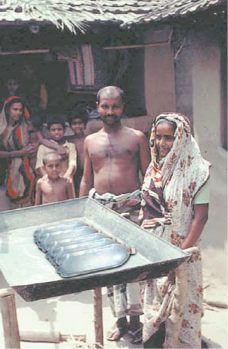 It is most often known as SODIS (SOlar water DISinfection), from the name of a department of the Swiss aquatic research institute (EAWAG) that has perfected the system and distributed it in some 20 countries, organising actions there to raise the population’s awareness of hygiene and health matters, and it is used by some two million people. the combined effect of the UV-A ultra violet rays and the increase in temperature in excess of 45° destroys the pathogens (microbes, bacteria, parasites - Giardia and cryptosporidia - or micro-organisms likely to cause illnesses and especially severe cases of diarrhoea) thereby making the water safe to drink. Sunlight is actually made up of a number of elements with differing wavelengths (the spectrum), including ultraviolet rays (with wavelengths of between 315 and 400 nanometres) and these are the most effective for destroying pathogens. As they penetrate the water, the ultra violet rays react with the oxygen dissolved in the water (hence the usefulness of shaking the bottle before filling it completely, to increase this) and it produces highly reactive oxygen molecules with free radicals that attack, inhibit or destroy pathogen germs. These radiations along with the ambient heat progressively raise the water temperature, which has a pasteurising effect, accelerating the process and already eliminating some of the pathogens that are unable to resist high temperatures. If the temperature reaches or exceeds 55°C, the disinfection time may even be halved. Transparent plastic (quality PET - Polyethylene terephthalate, as is the case most often for water or soda bottles) is the material that best lets ultra violet light and sun rays through. This, together with its light weight is why it is recommended. 1) First of all, obtain plastic bottles, or plastic bags, made from PET. 2) Carefully wash the bottles when they are used for the first time. 3) Fill the bottles to the three-quarter mark. 4) Shake the bottle for some twenty seconds to oxygenate the water. 5) Then finish completely filling the bottles. 6) Expose the bottles to the sun, e.g. by placing them on a roof or any other suitable surface (a reflective surface, or for example, one covered with a sheet of aluminium foil makes the process even more effective and fast). 7) Leave the bottles in the sun from morning till evening, and as a precaution for at least six hours. (even if disinfection proves faster in intense sunlight). 8) Then wait for the bottles to cool before consuming the water safely. Glass bottles must not be used (for it is hard for UV rays to penetrate them). For greater effectiveness, use plastic 1 to 2 litre bottles (3 litres max.) and with a maximum diameter of 10 cm. It is preferable, but not essential, to choose PET plastic bottles for they are lighter, easier for UV rays to penetrate and they can easily be found almost everywhere. Transparent plastic pouches can also be used, even if they are less handy. The bottles must be colourless and transparent. Bottles made from PET often have a bluish reflection, but this is not an issue. Storing the cleaned water (and serving it) from these same bottles is strongly recommended to avoid all contamination and the bottles should only be used for this purpose. If one of the bottles becomes scratched or deteriorates, it should be replaced. Whatever the case, bottles should be changed every four to six months. Turbid water is not suitable as turbidity considerably restricts the penetration of ultra violet rays. If the available water is turbid, then it needs to be filtered first, at least using a fine, clean, cloth. (Refer to Sheet E17 "Simple methods for treating water at home"). In practice, the water should be filtered as soon as its turbidity exceeds 30. Place the PET bottle full of water, upright on a newspaper headline and look through the water from the bottle opening, from top to bottom. If the headline letters cannot be read through the water, then it requires filtering. If there is no sun, or if cloud cover persists for more than half of the day, exposing the water for longer is recommended so that it receives at least six hours of sunlight. If the lack of sun persists for more than half of the day, then the bottles must be exposed for another day. The same applies in case of rain. Remark : Here the process shows its limits, so it is desirable to have a minimum amount of drinking water in reserve or, if not, to boil the water or even to plan on having a system for collecting rainwater (Refer to Sheet E4 "Collecting rainwater"). These are sunny regions located between latitudes 15°N/S and 35°N/S. - Practically no cost. No investment required. 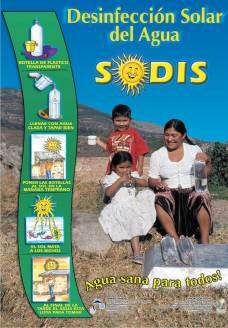 - SODIS claims that 99% of the micro-organisms responsible for diarrhoea or cholera are killed. - Well suited to treating small volumes of drinking water. - Uses a renewable and free energy source. - Treatment duration (at least six hours). - Cannot be used if the weather is too cloudy. - Requires cooling prior to use. - It is sometimes hard to find PET bottles in rural areas. Especially low, and can be put at between €1 and €3 per family, per year for purchasing or replacing bottles (a bottle may cost four cents, but is most often recovered), hence a cost per litre of less than half a Euro cent. To this cost should be added, where undertaken, and this is recommended, the cost of organising an awareness campaign on hygiene and health, prior to rolling out this process (Refer to Factsheets C1 to C4 covering the various awareness methods) that may cost one Euro per person. In Benin only 41% of the rural population currently have access to drinking water, obliging the rest of the population to attempt to purify water by boiling it, bleaching it, or filtering out its sediments. 17% of infant deaths are caused by diarrhoea caused by foul water. The government is actively seeking to achieve millennium targets and especially to bring the percentage of the population with access to drinking water up to 67%. To achieve this, it has multiplied the initiatives undertaken. One of them is, with help from CREPA the Regional Centre for Low Cost Drinking Water and Sanitation at Ouagadougou (Centre Régional pour l’eau potable et l’assainissement à moindre coût à Ouagadougou), from SODIS and Benin’s National water utility SONEB (Société Nationale des Eaux du Bénin), to launch a vast information and roll out campaign covering the SOLIS method in places where there is no drinking water. This campaign started two years ago and has been a great success, while awaiting more durable but also more costly measures. The number of illnesses, especially cases of diarrhoea, has fallen considerably in the many villages involved. Similar campaigns have also been run recently in Bolivia, Nepal and in Pakistan (1,500,000 people) with the same success. The Solvatten method was perfected by a Swedish body of the same name. This is actually a cleaver and handy adaptation of the SODIS method so that it is in fact only a variant of the above method requiring less handling and care. It comprises using a jerrican-like container made from a special reinforced plastic with two panels that are opened up and filled with water (it is however still necessary to first filter or decant the water if it is very murky), then an end of treatment indicator button is pressed and the complete device exposed to the sun. After two to six hours, depending on weather conditions, a red dot on the device turns green, showing that the treatment is complete. Then the water can be left to cool ready for consumption or immediate use as hot water for cooking food. The Solvatten method combines pre-filtration through a special micro porous cloth and disinfection thanks to the action of the UV rays and a rise in temperature to approximately 55°C. Its efficiency is very good and this has been acknowledged by a number of scientific bodies. This method is already in use, especially in Nepal, Haiti, Algeria and Mexico and it will soon be expanded to Burkina Faso, Ethiopia, Kenya and Chile. - An effective and reliable method. Handy and reassuring to use by persons on the move. - Greater treatment capacity than Sodis (able to treat 10 to 20 litres of water per day. - The containers have to be purchased in Sweden and shipped from there. - The cost is high for low income families (€70 ex-factory, in 72 unit palettes). - The water is not protected against recontamination when not drunk fast enough. - A five year limited life.